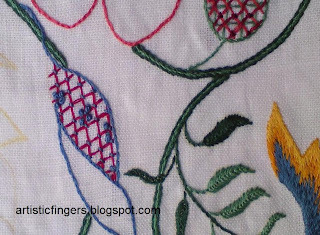 Kashmiri embroidery is one of the delicate and finest embroidery.The stitches used may be simple but the outcome is beautiful. 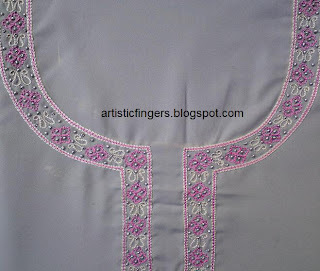 There are two types of kashmiri embroidery - sozni (kashida) and aari. 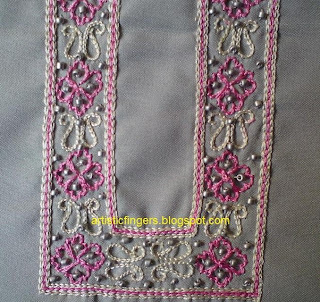 Kashmiri aari is worked with only chain or chain stitch filling.The hook used in this form is slightly bigger than the one which I'd showed y'all in my aari embroidery post.Sozni embroidery is done with crewel needle. 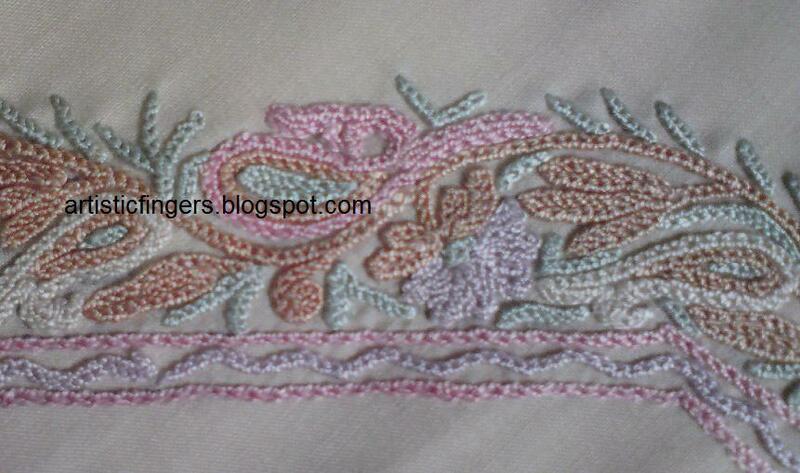 Paisleys and coils are the integral part of many kashmiri embroidery designs. Kashmiri embroidery is worked with Wool,cotton threads and sometimes silk threads. Only primary colors(pastel shades) were used earlier,but now lots of colors are used may be because of the client's preference and the availability of colors. 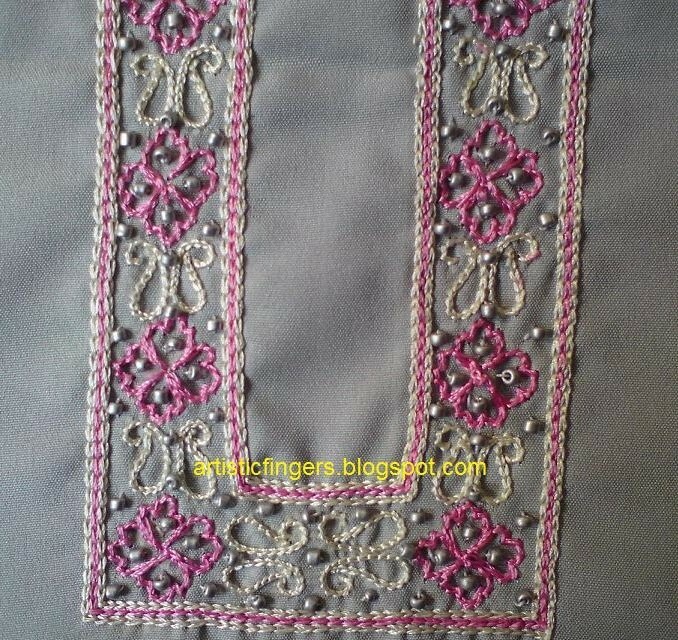 The finest Kashmiri sozni embroidery can be found on pashmina shawls and phirans. 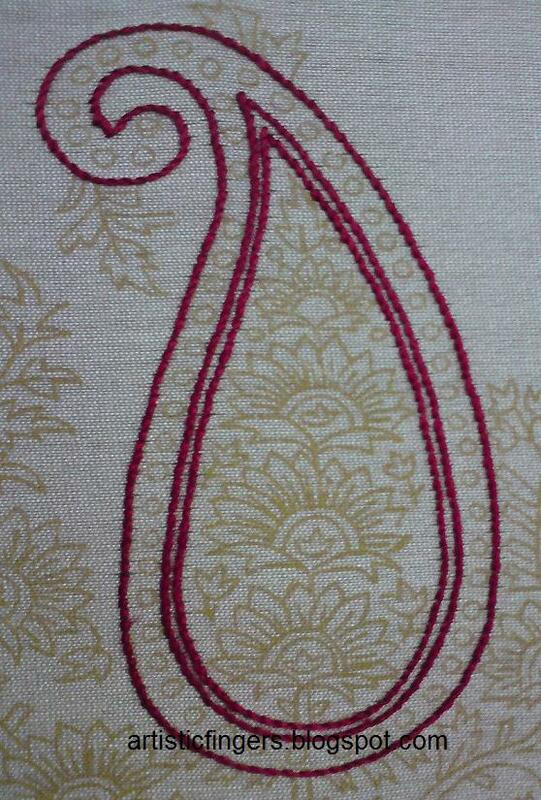 Kashmiri aari can be found on rugs,panels and blouses. 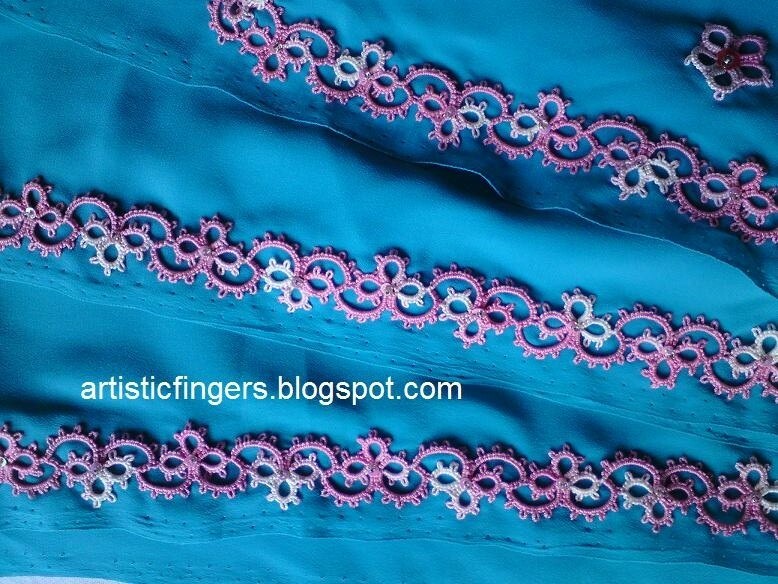 I'll be showing y'all a Kashmiri sozni(kashida) embroidery step by step. 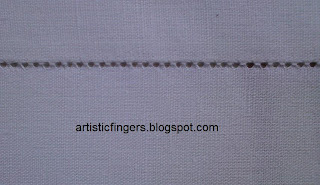 I've chosen a paisley motif and transfered it to a cotton silk material using a trace paper. 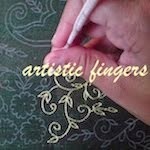 NOTE:Since the sozni designs are small and intricate prick & pounce method doesn't work .Transfer the design either with a light box or tracing paper. 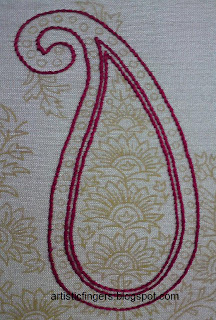 I've worked 3 lines of paisley in stem stitch using red stranded cotton thread. 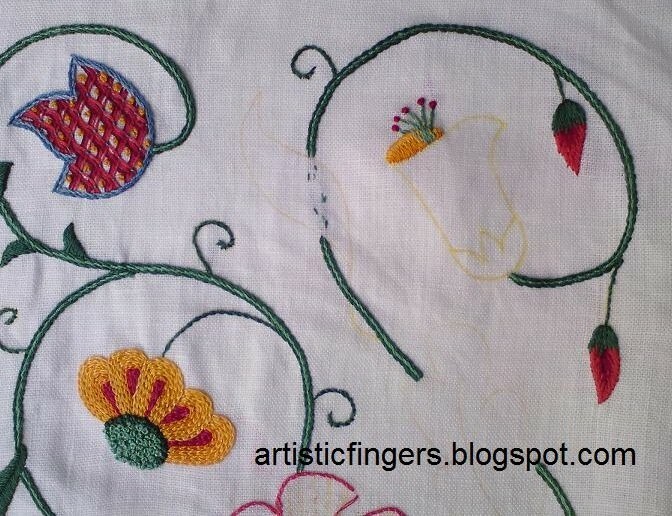 I'll be posting my progress here so come back if you are interested in kashmiri embroidery. 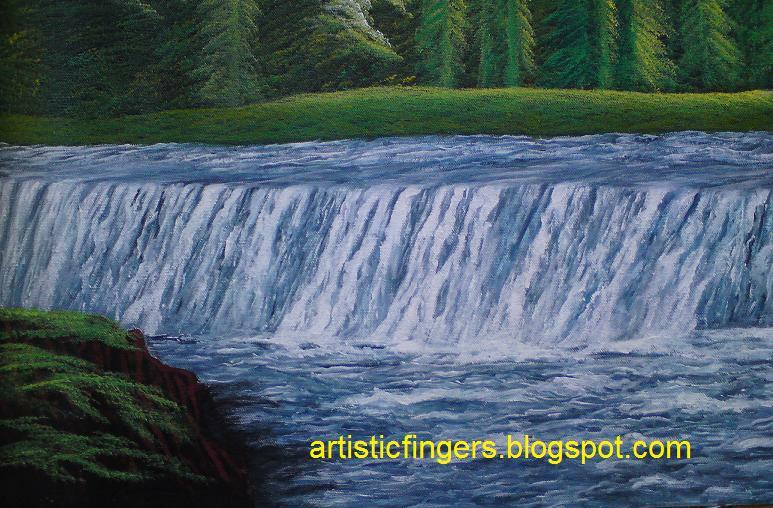 I'd promised to show the new embroidery project,but am posting an image of a painting (only a part) today. so it was really frustrating when I couldn't nail it. I was so.. happy when I got this right atleast to some extent,thought I should share this with my blog friends. What do y'all think?.Did I get it or not? I'd like to hear from y'all,so please do post a comment or mail me. 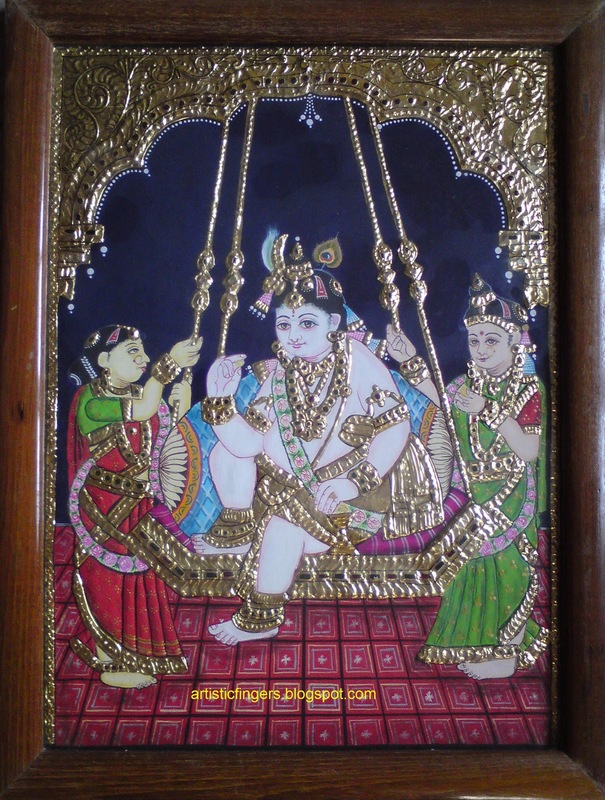 I'd like to share these images of a saree with you all. 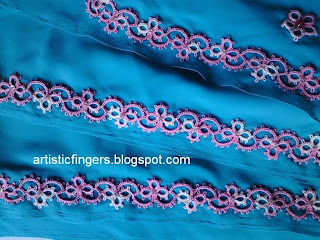 I'd attached a tatted border/edging and some motifs to a crepe saree. 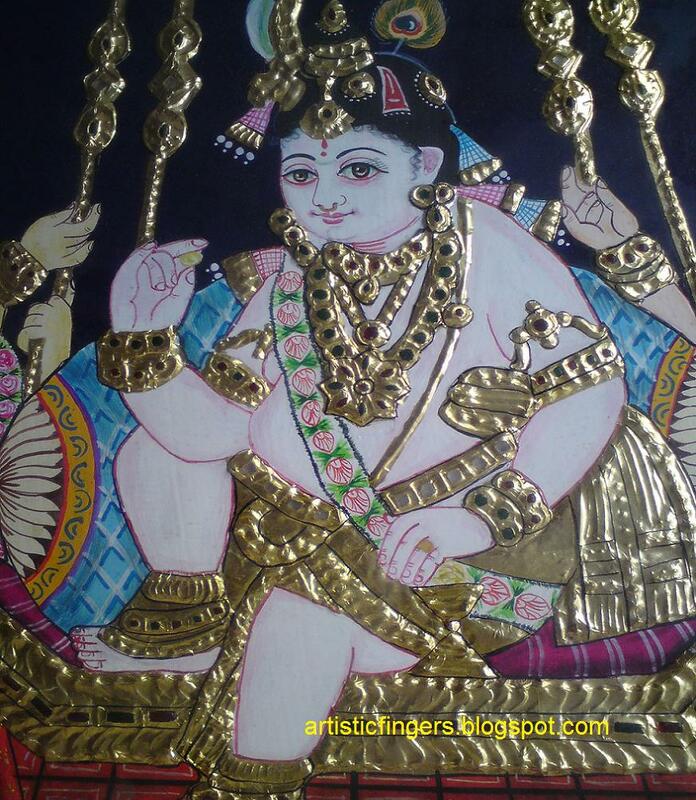 A saree is five and a half meters long & 44 - 48 inches wide. So I'd to work approximately 9 mts edging/border & 30-40 motifs. 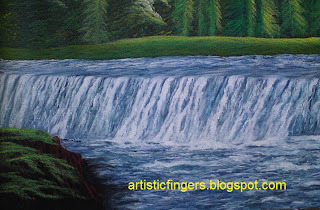 These are the images of my second new project. It's a surface embroidery and I'm using anchor stranded cotton. 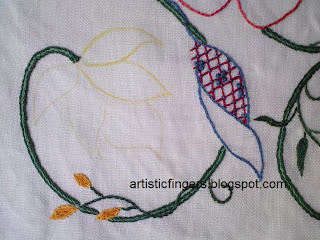 I'd worked the stem in 3 rows of stem stitch,tendrils in 1 row stem stitch,rose buds in long & short stitch,part of the bell flower is long & short stitch and pollens in stem stitch & french knots. is trellis and french knots. 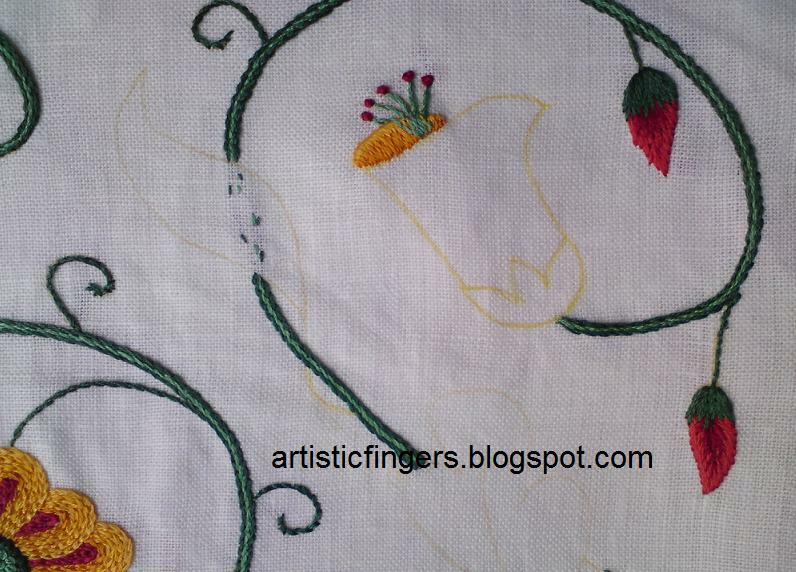 leaf in battlemented couching with 2 rows stem stitch outline. It's a crewel embroidery design by Shelagh Amor. I'd promised to show you all a couple of new projects in one of my previous post,remember? The first one is a white linen table cloth/runner.This is a brazilian embroidery project so I'll be using Edmar threads for the floral motifs. 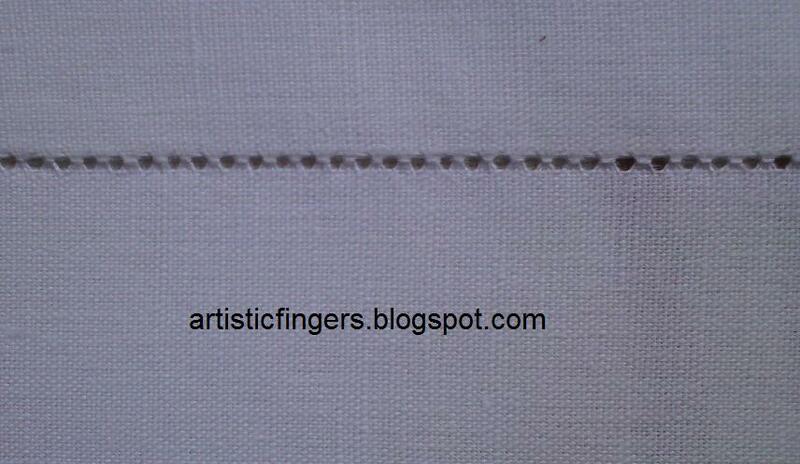 I'd finished the hem stitch on all the four sides using stranded cotton. 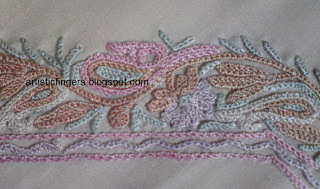 Then I'd worked spanish knotted feather stitch using pearl cotton to create squares. 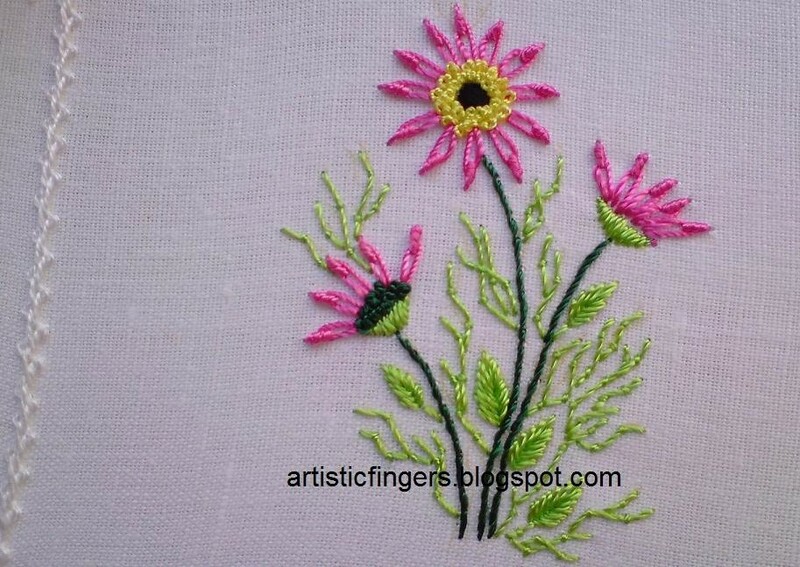 I don't think this stitch is part of brazilian embroidery.But I like it anyway. 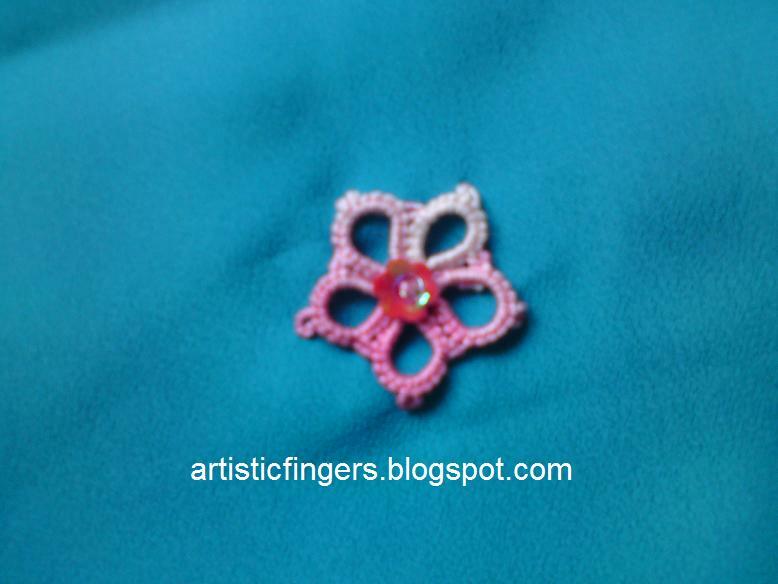 In this design I'd used Lola,Iris and Glory threads.I've got to work 8 more motifs. Will show you all another new project in my next post. I'd like to share the images of my first Tanjore painting (which I'd painted in 90's) with you all. I know there are mistakes. I've learnt so much from the mistakes I've made and I'm a much better artist now. I'd used pure gold foil and poster colors. 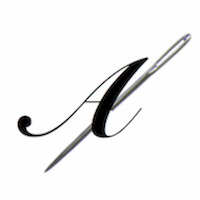 I've started a couple of projects this week,will show you all soon. 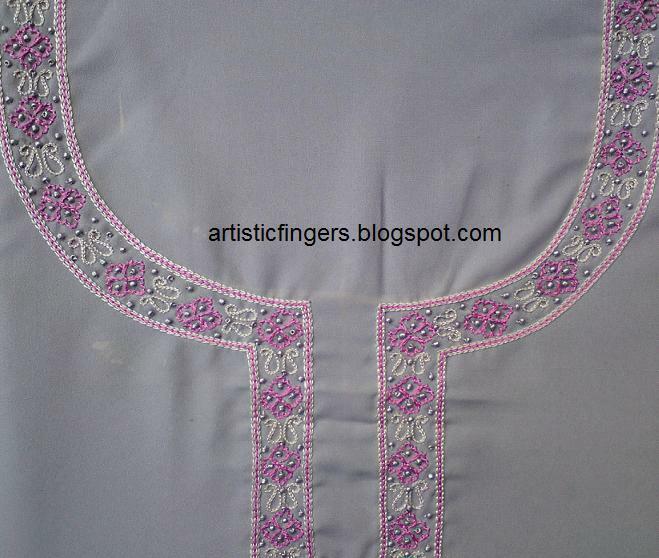 Today I'm posting images of an aari embroidered kurti. 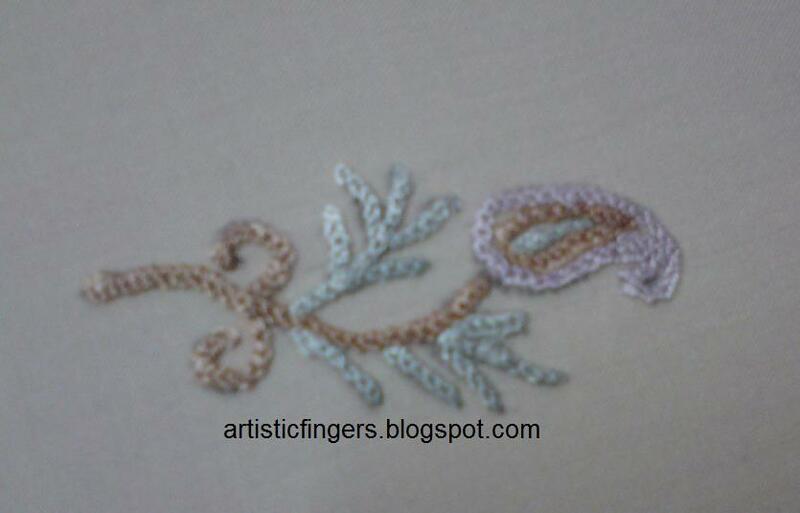 I've used silk threads and metallic silver beads.